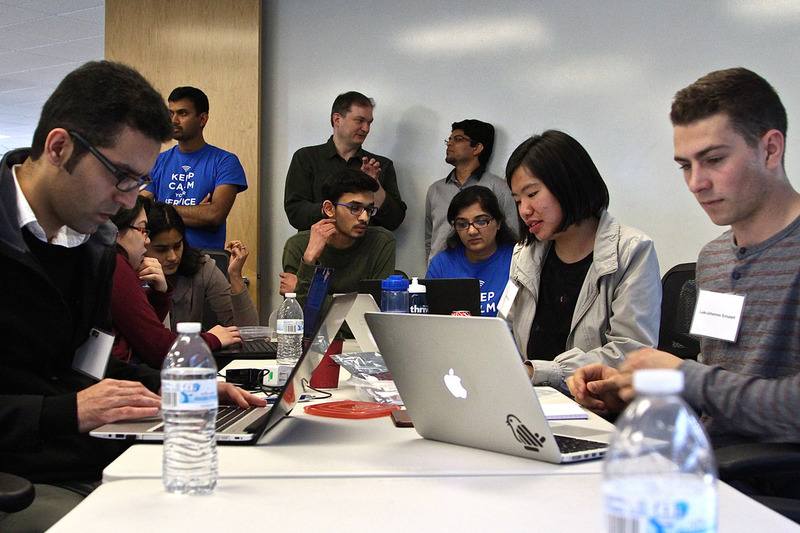 Thirty San Jose State undergraduate and graduate computer science majors spent a recent Saturday hunched over hardware chips and sensors as part of a two-week Internet of Things Workshop that kicked off on March 19. 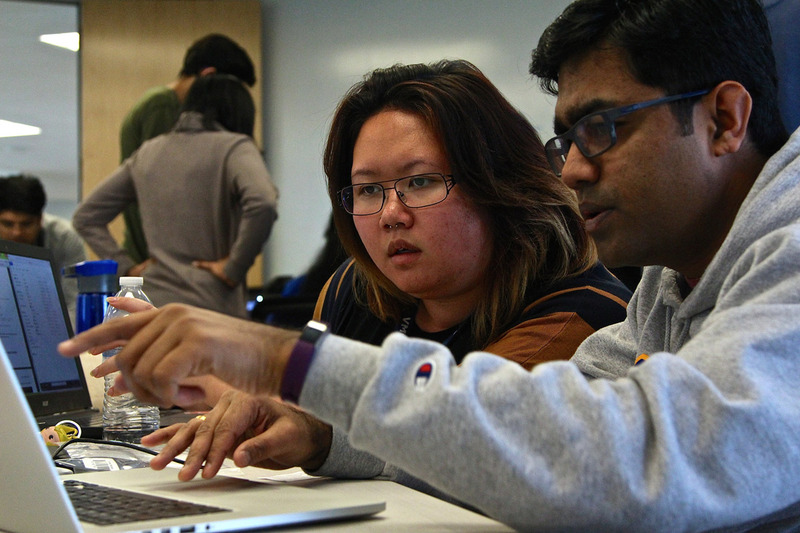 The workshop, born from collaboration between the SJSU Department of Computer Science and Aeris, a Santa Clara-based cellular network operator, offers students not only an introduction to various scripting languages but also the opportunity to create their own applications. “I am thinking about a smart parking garage, so you have an app that says ‘this car is leaving this spot right now,’ then you can direct the people looking for spots to that spot,” said Dennis Hsu, ’16 MS Computer Science. But even a simple idea requires sophisticated tech tools and collaborating with experts. This is where Aeris comes in. Aeris senior software engineer Maanasa Madiraju gives thirty San Jose State computer software engineering majors an introduction to downloading software needed for the workshop (Photo: Lauren Hernandez, ’15 Journalism). Meredith Ku, VMware intern, and Robinson Raju, MS Computer Science ’16, review the accounts they’ve just set up on Aeris’ cloud management system (Photo: Lauren Hernandez, ’15 Journalism). 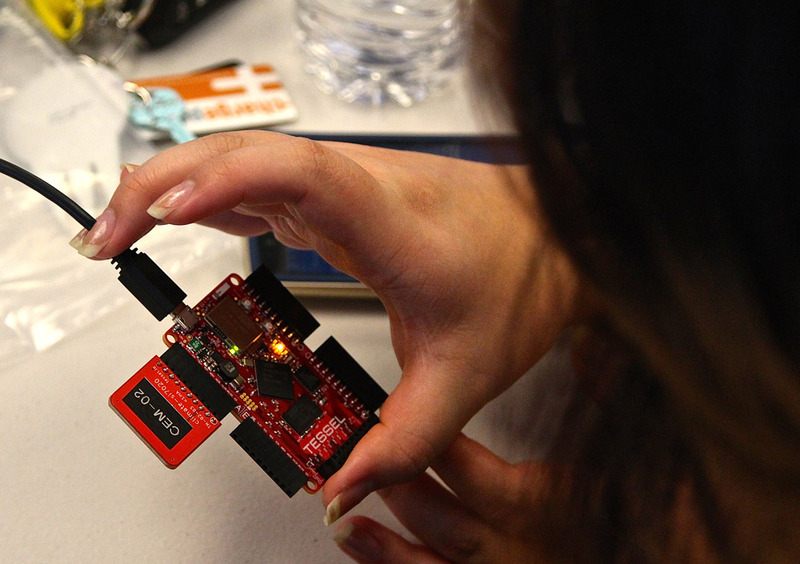 Meredith Ku, VMware intern, takes a closer look at a blinking Tessel Board as it connects to her laptop (Photo: Lauren Hernandez, ’15 Journalism). The thirty students are divided into ten groups of three, where they are tasked to work collaboratively to build an application over the course of two weeks to solve a real world problem or an application that has commercial value. Maanasa Madiraju, Aeris senior software engineer, guided participants in connecting Tessel boards to their laptops and navigating the company’s data management system. “Our basic objective is to help students learn new languages so they can use them for the mainstream jobs,” Madiraju said. Hsu, who envisioned the parking garage app, said prior to attending the workshop kick-off, the idea of the Internet of Things was an abstract concept as it relates to the broader connected world. “I like that we got hands-on experience with the devices and actually doing the programming with professionals who give us their feedback and their ideas,” Hsu said. 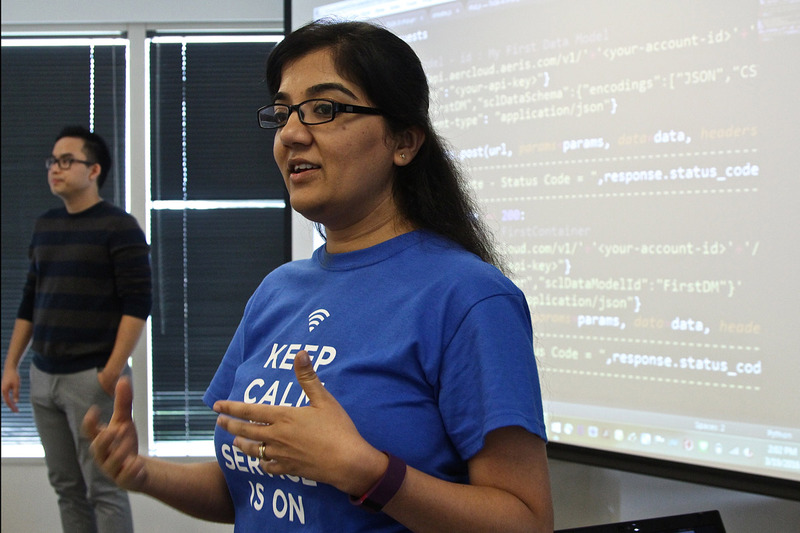 Paired with Vihneshwari Chandrasekaran, ’17 MS Computer Science, Hsu said most of their early conceptual application ideas were born from various examples provided in short information sessions proctored by Aeris software engineers. Aeris engineers suggested exploring applications that improve society in some capacity like water filter sensors for water crises, refrigerator sensors to prevent food spoiling and mobile payment applications. Over the next two weeks, participants will have the opportunity to visit Aeris offices to attend “office hour” sessions, where they can de-bug ideas and gain feedback from Aeris engineers on how to improve their applications. Students will present their final applications to Aeris on April 2, in a judging process that takes into consideration originality of the idea, technical achievement and execution, and real world value or commercial viability.